Mt. Hood Meadows is excited to announce our plans to begin construction on a new commercial building this summer that will significantly improve our resort experience for our guests. 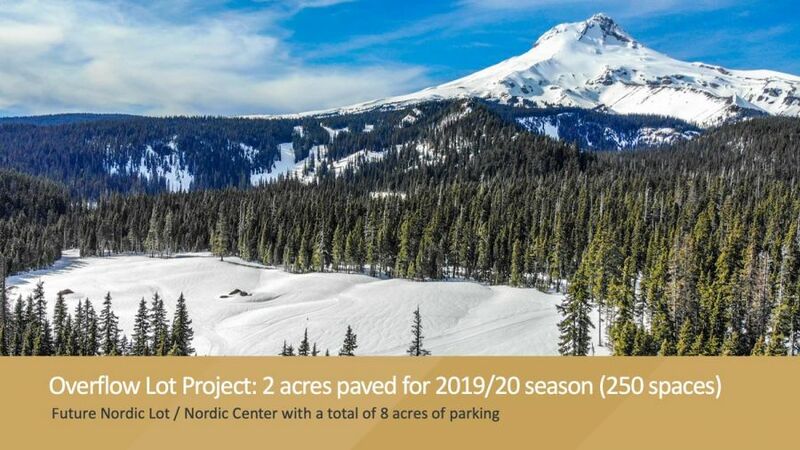 Sahale is a 23,500 square foot building that will house the Meadows Learning Center, ski and snowboard rental center and a new 10,000 square foot restaurant. The $15 million building will be constructed over the next two seasons with a grand opening target of Christmas 2020. Sahale will be constructed adjacent to the South Lodge and is the first significant commercial improvement at Meadows since the South Lodge expansion in 1999. With Sahale, we will reutilize the North and South lodge spaces to accommodate more guests for dining. Sahale and the existing space redesign will increase lodge seating by 900 - a 60% increase over what Meadows currently offers. That addresses one of the main complaints guests have - finding seating for dining on busy days in over-crowded lodges. We will also expand parking this summer adding two acres of overflow parking creating an additional 250 spaces for peak day parking. This is the first phase of the Nordic Lot project which eventually will pave the entire eight acre lot. This is a very aggressive schedule as we have other vital CAPEX projects we need to address. In addition to our regular lift and facilities maintenance projects, we will continue to invest in snow removal equipment and summer trail maintenance to improve our capabilities to open the season with a relatively small amount of natural snow. In order to raise the funds needed to break ground on Sahale this summer, we are making a limited, initial offering of 1250 Sahale Gold Memberships. This is a five-year season pass that must be purchased by May 31, 2019, and provides All Access Pass privileges to Meadows through the 2024/25 season. You pay for it up front, so that price will not increase. The Sahale Gold Membership Includes year 'round access, winter, summer and even any Spring seasonal extensions we offer in the future. If our lifts are running, we will reserve a seat for you. We have a special Sahale webpage that contains more information about the project and what it means for Meadows’ future. This initial offering will be limited to 1250 and will go on sale April 1, 2019. Thank you for helping us to improve “Your Mountain Home.” We're sure you’ll agree that the Sahale Gold Membership offering will help us make these much needed improvements our guests have been asking for. We thank you for being a part of making it happen!